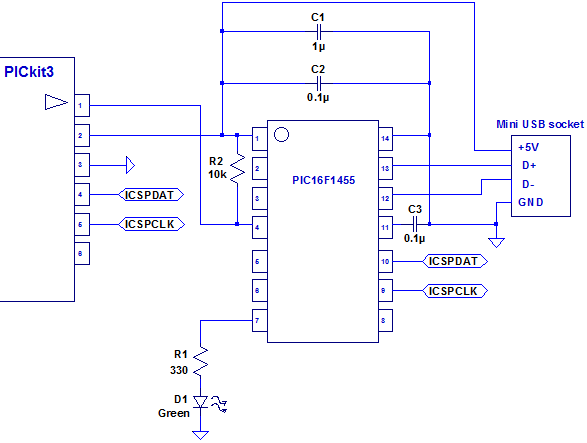 This time I am going to make a simple circuit using the PIC16F1455 and a mini USB connection. This will allow us to connect the PIC up to a PC (or any USB host) and communicate using a suitable device driver. I am going to use the serial class, so the PIC will appear as a serial port. 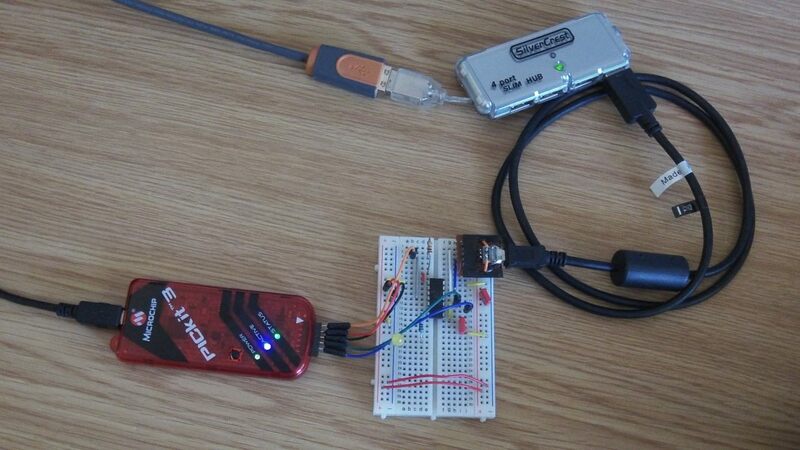 This is a very cheap way to make a USB interface – I reckon all the parts (retail) would cost about £1.50 (~US $2). In order to communicate via the PICs USB interface we need to get some code from Microchip. The code we need is the Microchip Libraries for Applications. I am using Windows 7, so I downloaded the Windows installer version. My advice is to install it to the default location, which for me was C:/microchip_solutions_v2013-02-15. If you like, you can try some of their examples, but they are all targeted at their development boards, so you will either need one of those, or you will need to modify the code a bit. I am going to create a new project, and then add USB support to it. 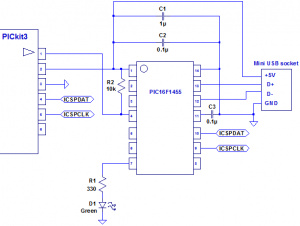 This is the same as before – create a standalone project, based on the 16F1455 using the PICkit3 and XC8. I have given it the rather unimaginative name USB_Blink3. The dot directory “.” will ensure that the microchip source files can find our local files. We now need to add some files from the Microchip’s USB library. I have put these in a New Logical Folder called USB, located in the Source Files folder. The folder is created by right clicking on Source Files, and selecting New Logical Folder. This will create a folder which we then have to rename by right clicking it and selecting Rename. #define USB_EP0_BUFF_SIZE 8 // Valid Options: 8, 16, 32, or 64 bytes. // a ROM BYTE *ROM variable named exactly USB_CD_Ptr must exist. //Make sure only one of the below "#define USB_PING_PONG_MODE"
// is available on the target processor. The device descriptor is defined as a USB_DEVICE_DESCRIPTOR type. needs to be the correct length for the data type of the entry. to the _DEFAULT attribute. Available options are _SELF and _RWU. _RWU tells the USB host that this device supports Remote Wakeup. defined as "64,0," instead of "64,"
length of this endpoint descriptor (7) and the descriptor type. transfer. The dir has the value of either 'OUT' or 'IN'. the endpoint. The last parameter in the polling interval. as a word array with the number of characters equals to <size>. the management of multiple strings through a look-up table. The above declaration has 3 strings, sd000, sd001, and sd002. USB_SD_Ptr, &sd001 must be in position USB_SD_Ptr and so on. descriptor, user must implement a structure similar to CFG01. The next step is to add the configuration descriptor name, i.e. state according to the definition in the USB specification. //These are your actual interrupt handling routines. //Check which interrupt flag caused the interrupt. * Overview:        Main program entry point. // Check bus status and service USB interrupts. // instruction cycles) before it returns. // Application related code may be added here, or in the ProcessIO() function. *                  are called from here. *                  also be called from here. //	current on D+ or D- when the host/hub is not actively powering the Vbus line. //	firmware needs some means to detect when Vbus is being powered by the host. //	self and bus powered, it should not return a hard coded value for this request. //	currently selected power source. On the PICDEM FS USB Demo Board, "RA2"
//	is used for	this purpose. If using this feature, make sure "USE_SELF_POWER_SENSE_IO"
//  has been mapped	to it. *                  initialization that is required. *                  corresponding to the USB device state. // add code that undoes the power saving things done in the USBCBSuspend() function. // additional comments near the function. // devices. Make sure to re-download the latest specifications to get all of the newest ECNs. //RestoreStateOfAllPreviouslySavedInterruptEnableBits();	//Preferrably, this should be done in the USBCBWakeFromSuspend() function instead. //RestoreIOPinsToNormal();									//Preferrably, this should be done in the USBCBWakeFromSuspend() function instead. //things to not work as intended. // operation before returning from this function. *                  implement callback routine as necessary. // No need to clear UIRbits.SOFIF to 0 here. // Callback caller is already doing that. *                  which error causes the interrupt. // No need to clear UEIR to 0 here. *					firmware, such as that contained in usb_function_hid.c. *					optional to support this type of request. *					as if it is in a low power suspend to RAM state). *					control	receiver. If a user presses the "power"
*					send a USB "command" to the PC to wake up. *						the remote wakeup capability. *                  doing so will cause USB compliance testing failure. *                  has the period of 1-15ms. *                  to accept remote wakeup. *                  to receive traffic from the host. *                  period of ~3-15 ms depending on the core frequency. *                  for at least 1 ms but for no more than 15 ms."
*                    or when having other interrupts enabled. *                    and verify the actual signal on an oscilloscope. //First verify that the host has armed us to perform remote wakeup. //Clock switch to settings consistent with normal USB operation. //until a new suspend condition is detected. //5ms+ total delay since start of idle). //Now drive the resume K-state signalling onto the USB bus. *                  data that is received via the control endpoint. *                  before the data arrives. *                  when the USB_INTERRUPT option is selected. //Add application specific callback task or callback function here if desired. //      on, by checking the handle value in the *pdata. If you build this, you will notice that it uses 472 bytes (46%) of RAM and 3536 bytes (43%) of Flash. This still leaves a reasonable amount of space to actually do something useful. The code I have put in is in ProcessIO, and just checks if we receive the characters ‘1’, ‘2’, ‘3’ or ‘4’. It will then change the speed at which the LED flashes, and return “Done” via the serial connection. You will replace this with something else, so I have made no attempt to make this code useful or well written. In order to communicate with the PIC you will need a serial communication application on your PC. I have used Realterm, but any similar program should work. This entry was posted in PIC USB Solutions by jon. Bookmark the permalink. Firmware for USB HID ?